In the summer time, when we can have days and days of extreme heat, it’s very important to maintain water supplies for your lawn and garden. What can you do when water supplies are low or the rain is refusing to fall? There are lots of DIY projects you can do to keep your landscaping happy and healthy. Rain barrels are an easy fix, you can find rain barrel kits at Lowes or Home Depot or make them on your own using plans on Youtube or the DIY network. 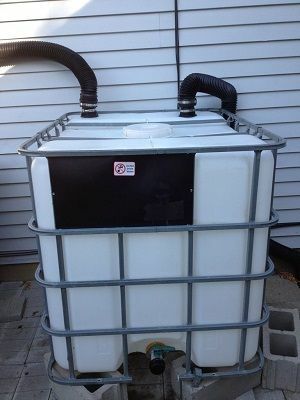 Plan for the summer all year long, using fifty five barrels to store plenty of water for the dry months, just make sure to include drainage holes near the top for overflow. Another great way to control your water needs is to use container gardening. Planting in containers will limit the amount of water you need. 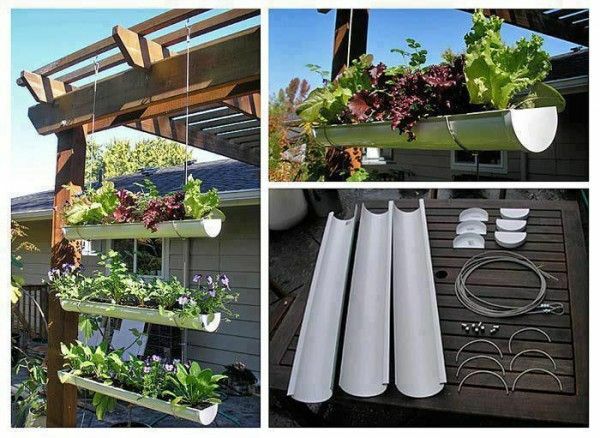 Containers don’t need to be expensive either, you can get creative and use discarded building supplies, like gutters, which are very popular right now. Summer time is vacation time, but don’t feel like you have to stay at home to water the plants. 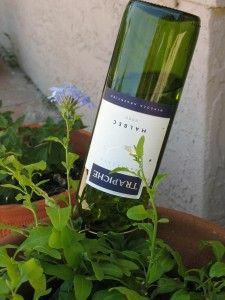 Fill 2 liter soda bottles or wine bottles with water and revert them into the ground nearby where you need water most. Your plants will soak up what they need leaving you to enjoy your free time and the gorgeous weather! Don’t have time to do it yourself? Give us a call at Algiere’s! We’ll put a plan together for you and help you keep up a routine of water management all year long. This entry was posted in Uncategorized and tagged container gardening, Garden, gardening, gardening for kids, gardens, gutter gardening, Home, home improvement, how to, landscaping, management, plants, Soil, water on August 22, 2014 by mspetersonexplains. All Aboard the Warrior Dash! We at Algiere’s take our work seriously, but we rarely take ourselves as seriously as the care we take with your lawn care needs. This year we’re kicking off a campaign of goofiness with Michelle and the boys participating in the Connecticut Warrior Dash on September 20, 2014. Not only does it give us a chance to let off some steam, it gives us a chance to promote healthy living and exercise. Things have gotten competitive, with some smack talk on who is stronger, Michelle or the boys? Like the Algiere’s page at https://www.facebook.com/AlgieresLandscaping to join in the fun and cheer for your favorite side. For more information on the Warrior Dash, you can visit the website at https://www.warriordash.com/location/2014-warrior-dash-connecticut-2/. This entry was posted in Uncategorized on August 4, 2014 by mspetersonexplains. Long time Algiere’s employee Jeremy has decided to move on and drive for UPS full time, and while we wish him well, it leaves some very big shoes to fill. We’ve succeeded with three great new team members, Pat, Tyler and Dale. Pat was a health and fitness major at URI, so he’s not adverse to the hard physical labor involved in landscape work. Tyler is a student at QVCC who enjoys playing horseshoes in his spare time. Like Pat, physical fitness is important to him, Tyler was responsible for getting the Algieres crew involved with a local kickball league. Dale is a special per diem player with Algiere’s. A retired contractor in his late sixties who lives in Voluntown, Dale helps with some of the handyman jobs over the summer. Please join us in welcoming these three great guys to the Algiere’s family! This entry was posted in Uncategorized on July 13, 2014 by mspetersonexplains. Last time we discussed different styles of gardens, and mentioned details such as fountains, sculpture, and shrubbery. While these elements look great in the background, sometimes you want something special to catch the eye that ties all of your landscaping plans together. 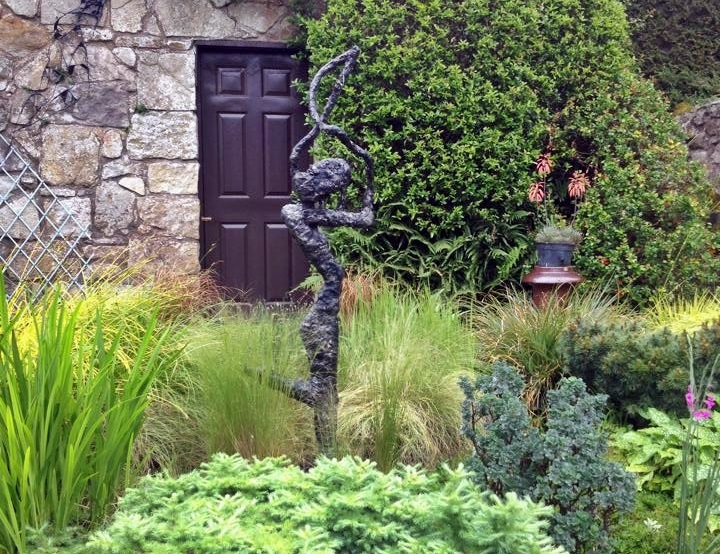 This is the focal point, and choosing one can be easy when you have an experienced landscaper like Algiere’s to help. The important thing is to keep everything in perspective. What is your budget like? Is your priority something large, or do you want to spread the money around? Do you prefer a plant or architectural focal point? How much time do you have for maintenance, do you want something that requires a lot of work, or would you prefer something more low maintenance? Consider your style of house and any elements you already have. You don’t want to clash or have anything stick out inappropriately. It might seem overwhelming, but a good landscaper will sit you down and ask the right questions to get the answers. For example, we might ask if you prefer lilies or daisies. It might seem simple, but the answer tells us a lot about you and your sense of style. Lilies are a more formal flower, while daisies take center stage in a more cottage style of gardening. 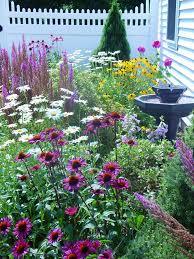 We will show you pictures of different kinds of plantings and styles of gardens. We can accommodate anyone, whether traditional or more eclectic and funky. Just give us a call! 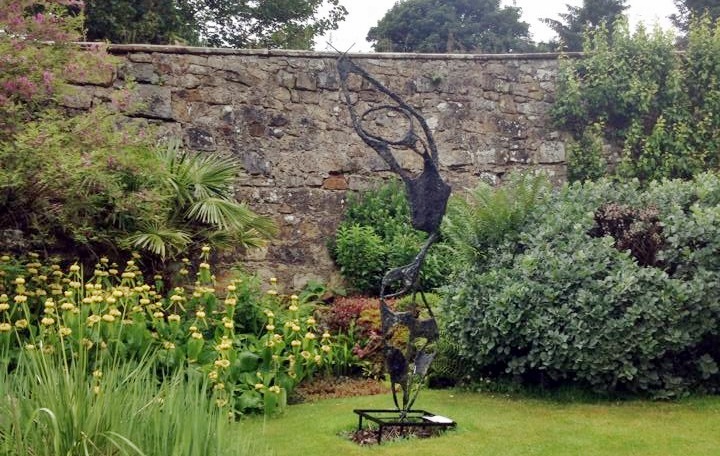 Pictures for this week’s blog were taken in the Abbey Gardens in Culross, Scotland. The modern sculptures are by the British artist Julia Francis. For more information on her work, you can email her at julia@themercatgallery.com or visit her Facebook page at http://www.facebook.com/JFSculptures. This entry was posted in Uncategorized and tagged art, cottage, design, focal point, Garden, how to, landscape, landscaping, modern on June 27, 2014 by mspetersonexplains. 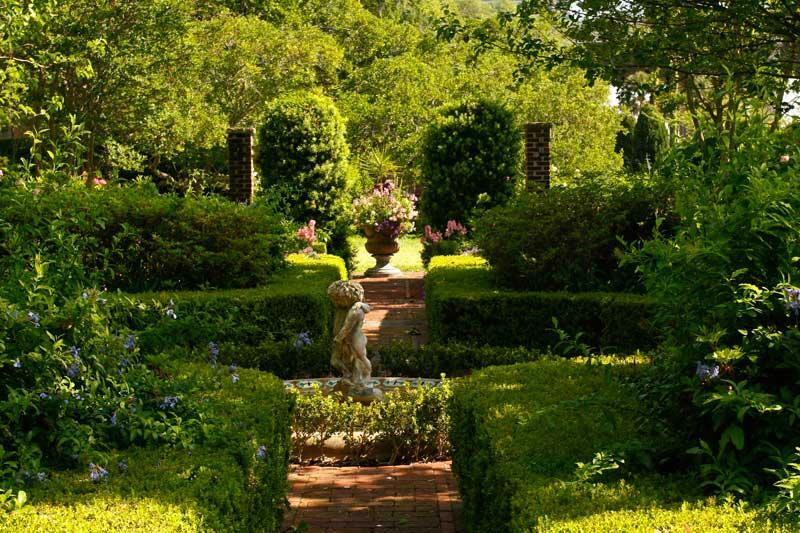 When planning a formal garden, it’s good to know what style suits both you and your landscape. You may have heard terms like English, Japanese, and Cottage gardens, but what do those terms really mean? 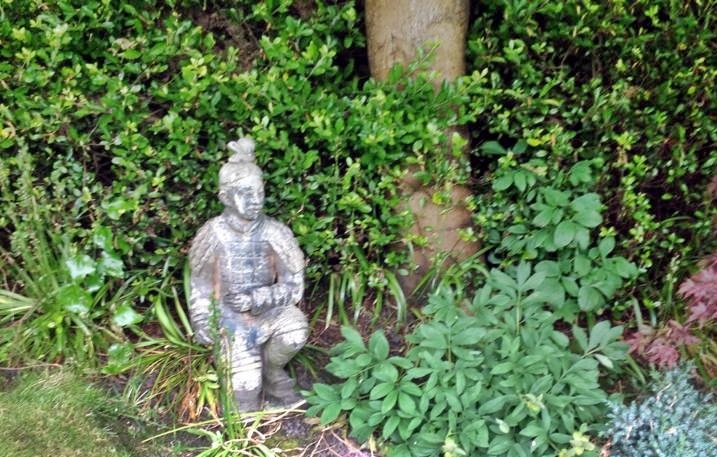 An English garden features architectural touches, like fountains and statuary. 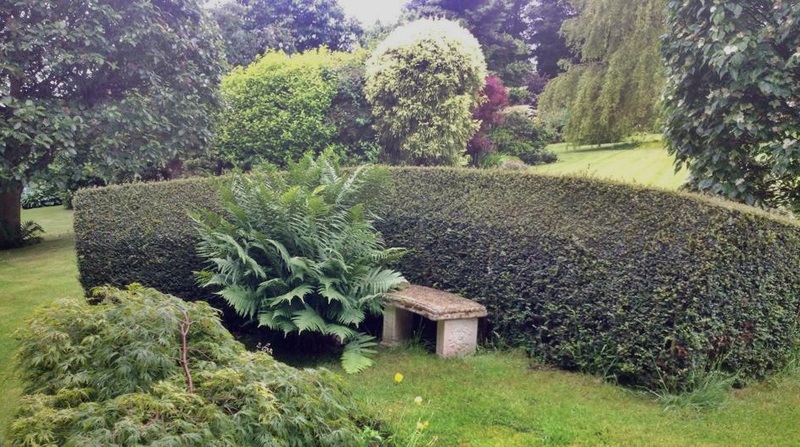 You’ll also find in many traditional English gardens, (called landscape gardens in the UK), little grottoes made of shrubbery with benches to hide away in for an hour or two with a good book. Winding paths join grotto to bird bath to statuary. This romantic style works well in larger yards and features more greenery than flowering plants. 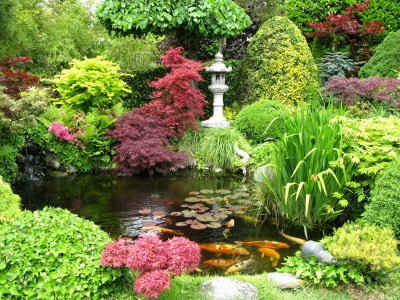 A Japanese garden will typically have some sort of water feature as its focal point, typically a small pond or flowing stream. It will attempt to mimic the style of house or building it’s attached to a bit more than an English garden typically will. While a Japanese garden will feature stone work and paths like the English garden, you’ll see more flowering bushes and shrubs, like dogwood or cherry. A Cottage garden will be much more dense and focus more on flowering and fruit plants than stonework or water features. It tends to layer fruit trees, climbing plants, and flowers, roses being a typical choice for this style. While these three are typical styles, there are many others out there to explore. Get creative, do an internet search and jot down styles you like, or pick and choose elements from a few that you imagine would work well together. Then call use at Algiere’s, we can sit down with you and work out a plan that fits both your aesthetic and your square footage! This entry was posted in Uncategorized on June 6, 2014 by mspetersonexplains. Spring is the perfect season to take a critical eye to your landscaping. 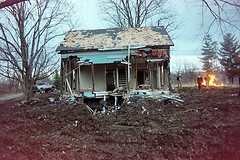 Is your yard looking sloppy? Outdated? Overworked? Maybe it’s time to contact a professional landscaper like Algiere’s and design a plan to clean up and update. The first thing to think about for any large project is to set a realistic budget. Remember, you don’t have to do everything at once. Curb appeal, the front yard, should be a priority, but make sure that you have established a relationship with your landscape artist; you don’t want to sign a contract with someone that in the end you can’t trust. Remember, it’s your yard and you shouldn’t have to pay more than you feel comfortable with, or purchase things you don’t like. Deal with someone who will sit down with you, take the time to ensure that there aren’t any underlying problems, like pest infestations or poor quality soil, that have to be dealt with first. Think a professional like this is too good to be true? Check out Angie’s List for someone in your area. While you’re there, check out the reviews our clients have posted about Algiere’s. Then if you like what you see, give us a call first. This entry was posted in Uncategorized on May 16, 2014 by mspetersonexplains. Need a retaining wall, but afraid you’ll end up with an ugly slab of concrete as a focal point? Not to worry, we’ve come a long way in materials and design when it comes to retaining walls. A retaining wall helps to hold back the laws of gravity, keeping the soil in your yard stable and preventing erosion. The material you chose to build your retaining wall from is very important. Different sizes may work on the same laws of physics, but precast concrete can come in many gorgeous colors and designs. No boring slabs here! Interlocking blocks of concrete can give you the beauty of natural stone with the affordability of concrete. A product we love to use is Bradstone by Nickelock, which looks and feels like real stone with the strength of a pre-engineered product. So a retaining wall can be functional, but it can also be beautiful. In addition to creating a raised planting bed for you, it can also add value to your home by increasing curb appeal. Or, you can use the leveled area to create a patio space or expand your yard. 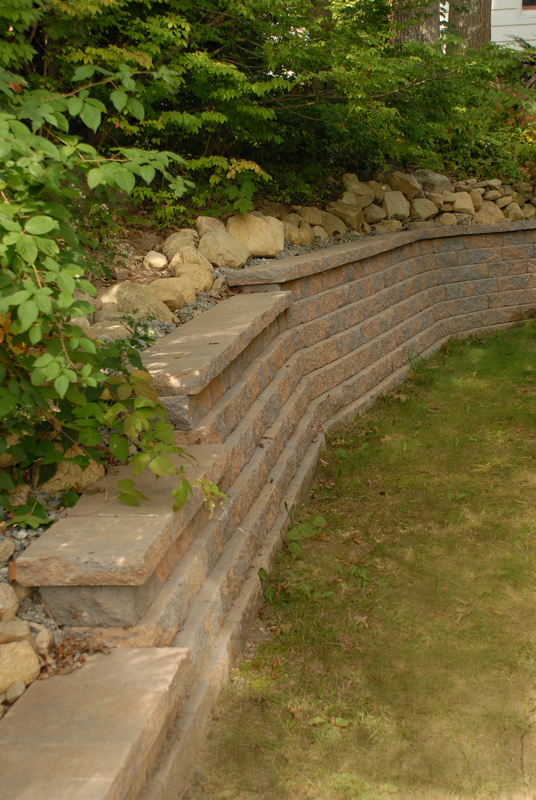 Whatever you decide to do with your retaining wall, one thing is for sure. It’ll be a lot lovelier than a pile of dirt or a sink hole in your yard. Why wait? Call Algiere’s today to set up a design consultation. This entry was posted in Uncategorized on May 3, 2014 by mspetersonexplains.